Beard of Zeus was, in a word, stellar. 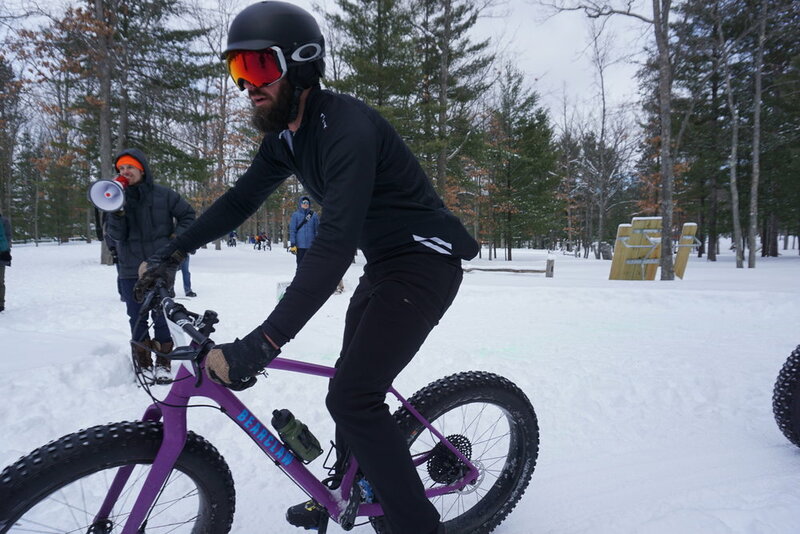 If you made it out to join us at Timber Ridge, then you know what a race, what a party, what an event the finale of the Short’s Brewing Fat Bike Series was for 2019. Last year, the race was cancelled due to ice. This year’s edition of the race couldn’t have seen a more idyllic winter day. With temps hovering in the mid-20s and the sun peeking intermittently between batches of puffy, lazy clouds, it was the perfect weather for shredding. With a two-mile course for the day, we put in a load of work to pack the dry, powdery snow. John Roe was out at 4am on race morning to give the entire course a final pat, with just an inch of fresh stuff settling over the topped of the packed base. With over 100 riders putting in 8-10 minute laps for the leaders and 15-20 minute laps for the more party-minded, the course help up just about as well as we could have possibly hoped with the dry snow. There was plenty to race for Saturday, too, and the Men’s Open took center stage. With Sunset Scott and Rick Wetherald tied on points, whichever rider finished ahead of the other on the day would nab the Series. Previous BoZ winner Jorden Wakeley was ready to take the spoils of the day, while Series regulars like Eric Langley, Paul Olson, and Kyan Olshove were eager nip onto the podium, should the opening arise. After riding together early, a crash saw Sunset distanced, and cost him a bottle cage ripped right out of his frame. He spent the rest of the day chasing against a 1’20” gap to Rick and Jorden. Ahead, Rick was all-in on the front to keep that big gap open, knowing that with lapped traffic and any mistakes, 60-odd seconds could disappear in the blink of an eye. Wakeley was happy to sit on and race for the last lap, while a bigger chase group that would eventually collect Langley and Olshove was headed up by the Master’s podium fight, including John Duby, Kris Sands, Rob Goepfrich, and Scott Diment. On the women’s side, Susan Vigland easily stayed perfect with a fourth straight win, putting in a few minutes early and holding the gap for the full 90 minutes. Chelsey Schlict put in some rock-solid lap times for second, while women’s master’s leader, Cindy Duby, also stayed perfect, riding away meter by meter from Amelia Hasenohrl and Kamie Wade. Sunset never quite got back into the hunt for the race win, and with a move with a half a lap to go, Wakeley survived the lapped traffic pitfalls to take his second win of the Series out of two starts. Wetherald came home second with Sunset third, enough for the pair to stay comfortably first and second in the final Series tally. Paul Olson won the men’s master’s, but it was John Duby who claimed the Series after riding with metronome-like consistency since things started way back in January at Fat Chance. Cindy’s perfect season means the Duby mantle must be getting a bit crowded with medals and trophies early in 2019! We had an absolute blast really taking on Beard of Zeus, and event we’re happy to add to our ever-expanding calendar of races and rides that covers every season. 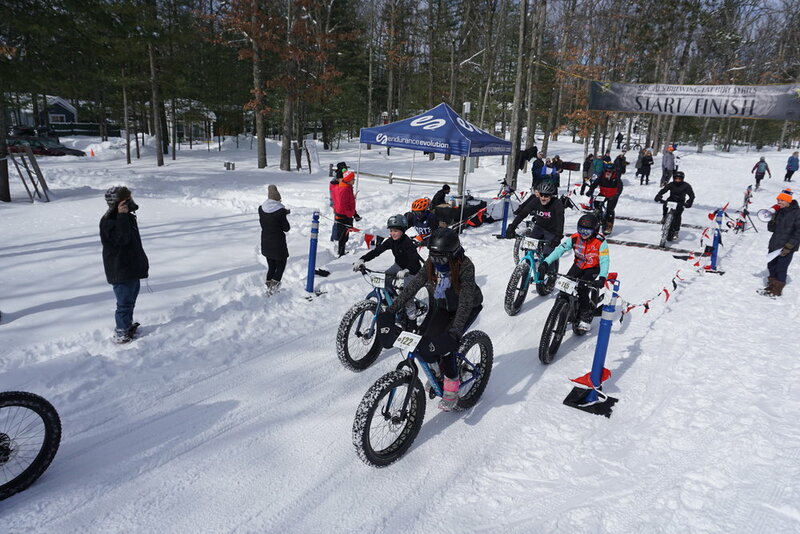 Of course, we couldn’t done it without the dozens of volunteers that manned the registration table, marshaled all afternoon, helped with parking, and contributed to make this one of the most enjoyable fat bike events of the winter! And you can feel good about being there; 100% of proceeds from BoZ go straight to NMMBA, helping us bring you the best grooming, new trails, and advocating for our sport around the region and across the state. A big thanks to Short’s Brewing, Einstein Cycles, Bearclaw Bicycle Co., 45NRTH, Velocity, State Farm Insurance Agency, Paddles and Pedals of Bellaire, Timber Ridge, and all the folks who helped to bring this together. A very special thanks to the guys at up.bike, who turned their hand to designing some very unique medals at Fat Chance and Series trophies for us, both times on short notice! Make sure you head over to check out the full race results and take just a second to congratulate a racer for their hardwork. We had a great experience with our old friend Jason Whittaker on hand running the timing, and it’s always a pleasure to have accurate results in hand the second the last rider rolls through. Want To Help Us Throw A Party? Beard of Zeus Is Almost Here! On March 2, we’re putting on the biggest party of winter, and one of the most fun fat bike races around! This year’s Beard of Zeus Fat Bike Race at Timber Ridge is 100% our thing, with 100% of proceeds going right back into the trails. We’re aiming to make this year’s race the most fun edition yet, and that’s no small feat. The circuit-style course on Timber Ridge’s property makes for fast, exciting racing for athletes and spectators alike, and there will certainly be spectators. The original winter party in the woods, Suds’n’Snow, starts just as we’re wrapping up, which gives us plenty of enthusiastic fans for the final few laps. 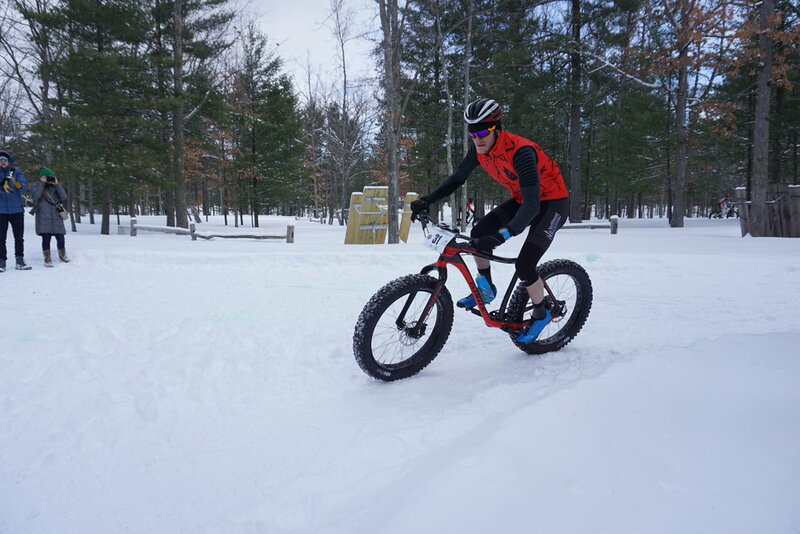 It’s the fourth stop in the Short’s Brewing Fat Bike Series, which means it’s the final chance for riders looking to pocket a few valuable points before wrapping up the season. After the Dogman Challenge, standings are tighter than ever, the Men’s and Women’s Open categories couldn’t get much tighter! Expect to see some aggressive, competitive racing from the Series regulars, as well as plenty of folks out taking on their first race ever; it’s one of the most accessible events of the whole year, so if you haven’t toed the line before, make it a priority to join us on Saturday! If you aren’t planning on racing, we could use a few folks to help us make this party one folks won’t soon forget! If you’re available Saturday from 10-11:45 to assist with day-of registration and packet pick-up, and could even stick around to cheer, shout, and heckle, we might have some goodies for your efforts. Registration for the SBFBS Beard of Zeus is open right here. If you can help out, email us at communications@nmmba.net and we’ll be in touch! We are just over a week away from the North American Vasa, the highlight of winter here in northern Michigan! The 43rd Annual North American Vasa is a true festival of races, inviting winter enthusiasts to test themselves against the trail and the elements in freestyle and classic skiing, plus 40 or 20 kilometers of fast, fun fat bike racing later in the afternoon. It’s an event that as grown and re-shaped itself to serve the winter sports community over the years, and the current iteration of the Vasa offers a little something for everyone, while bring all sorts of athletes to celebrate winter in all its glory. 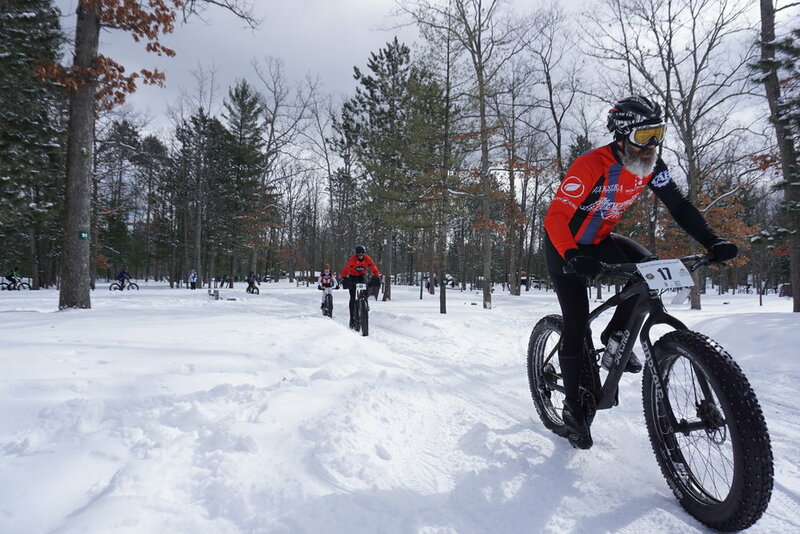 The fat bike races are known as some of the prestigious and beautiful event on the calendar. It’s a rare holdout in that it doesn’t rely on short, 1-2 mile laps like many fat bike races. While those are really fun for racers and spectators alike, most were born out of necessity; it takes a lot fewer resources to groom a mile or two compared to maintaining 10 miles or more! We’re committed to grooming not only our normal Winter Sports Singletrack, but have added sections of Riley’s Loop and Logger’s Run, plus helping clean up section within Timber Ridge, to offer racer a chance to explore the full cornucopia of trail flavors we are so lucky to have access to here in Traverse City. The two races take on one and two laps of the 20 kilometer course. The lap includes an exciting mix of singletrack and wider two-track to allow for plenty of passing opportunities, which you’ll want to take full advantage of before spilling into Yeti’s Revenge, a seasonal ‘floating trail’ floating singletrack that has become a local favorite. It’s a course that is as fun as it is challenging, and whether you’re going for the crown or going for fun, it’s really a treat to ride. Last year, a number of riders finished the 40km race inside two hours, while plenty of others were comfortably withing two and a half hours. It’s a race that is very much dependent on snow conditions, and with that in mind, our groomers have been in the woods almost non-stop since this recent blizzard fired up. We’re working hard to clear and compact trail, and the warm-up this weekend should be a big help in turning a great base into a firm and fast track for race day. We also wanted to point out one of the unique and incredibly cool ways to take on the Vasa. The race offers two combination races, the SkiFatalon and the Triple Threat Challenge. The SkiFatalon combines your time from the 27km ski and the 40km fat bike race, a grueling way to get in both of your favorite winter sports in a single morning. If that isn’t enough, you can always do more, as in doing the full 50km ski, the 40km fat bike race immediately after, plus hopping in the 35km Classic race on Sunday! If you’re ready to go give the 2019 course a look, you can use the gpx files right here. We’ve also got all the Vasa maps you need uploaded to the Vasa site right here. See our incredible trails for yourself on February 9; sign up for the 43rd Annual North American Vasa and see the best singletrack around! What. A. Ride. Iceman 2018 Was Incredible! There really is nothing quite like Iceman. A frosty chill in the air, some frozen sleet and a touch of snow in the morning, and a flying-fast course will make 2018 go down as one of the quickest editions of the race in the past 29 years. 5,000 riders braved the cold to thrown down on what might be the freshest iteration of the race route in a number of years. NMMBA put countless hours into designing a balance route that offered a little something for everyone, while always putting safety first. When you pour 5,000 riders into a singletrack, you’re putting both people and trail into a tough spot. That’s why Tom White and the rest of our trail crew offered up some new sections of gravel road before and after crucial points of the race that contributed to opening up gaps between riders, and rewarding smart positioning and good bike handling. That new gravel road was extremely important, leading directly to what may have been the decisive point in the day for most waves. Tornado Alley is a short but important stretch of singletrack before crossing Dockery Road, and by all reports, served as the first test in both the first few morning waves and the Pro races later in the afternoon. We were happy to receive some glowing reviews of the course, as well as very few reports of singletrack back-ups, which have been issues in years past. We also gathered plenty of feedback on our trail work the other 364 days of the year at the Expo on Friday. Thanks to plenty of volunteers from TC, Glacial Hills, Bike Leelanau, and Cadillac Pathway, were were able to talk, answer questions, and sign up plenty of new members both in person and online! Seven lucky people also strolled home with a custom, stainless steel display stand from our pals at up.bike! Congrats to everyone who raced, and a special thanks to all the volunteers that make such a big event possible. While it might be the end of racing this fall, we’re only just gearing up for winter fat bike riding. You can help us prep the Winter Sports Singletrack this Saturday, November 10 from 9-12. We’ll get sticks, limbs, and branches cleared to avoid any issues once the snow falls. We’ve got a very narrow winter to do so before rifle season starts the following weekend, so if you can make it, we need all the hands we can get!